MealPal Promo Code for $50 off! Many of my friends and co-workers started using MealPal in San Francisco. And though it sounded like such a great deal with a built-in savings every day, I decided not to jump on the MealPal bus at that point. At that point, I wasn’t ready to change up my regimen. I now regret not having joined MealPal sooner. I’,m not sure why I didn’t sign up because if you’re buying lunch everyday like I am, it’s a no-brainer. Basically, you sign up for a meal subscription for a predetermined amount of meals each at approximately $6 per meal. The meals are normally pre-made (or pre-prepped) by the restaurant. the fact that the restaurant can get an accurate count on how many meals to prepare for, they can make them altogether and during a specific timeframe; it’s efficient and still profitable. And because you set a time to pick it up, the food is at its freshest. In a nutshell, MealPal is subsidized lunch from extremely local restaurants for discounted. At six to seven dollars per meal (cheaper if you’re on the bigger plans) is a savings of 30-50% off in cities like New York and San Francisco if you were to go out and buy lunch yourself. When comparing that to $14 salads and $12 sandwiches, MealPal is fantastic. Plus there’s no need to wait in line and you can choose from a variety of cuisines. MealPal is a sweet deal if you already pay upwards of $10 for lunch in cities like New York. If you usually go out for lunch, want to explore new restaurants, and enjoy avoiding lines, it’s perfect. But there is a limited menu, and if you’re on a food budget like me, the price still doesn’t beat grocery shopping and bringing your own lunch. Basically, if you like trying different foods, convenience and relatively cheap meals, you’ll like it. But it probably won’t be cheaper than cooking at home and bringing lunch to work. What makes MealPal even a better deal and more affordable is that they run a really fantastic promotion. From time to time, Mealpal ups the referral reward when new members receive either a $50 Amazon gift card or a $50 VISA e-gift card when they sign up for MealPal. You’ll get a $50 Amazon gift card for each friend who signs up! When your pal signs up, they’ll get one too. Eating is always better with a pal! During other promo periods, they’ll reward new member subscriptions with a $30 Visa Prepaid Card. Still, that’s cold hard cash you can use anywhere that accepts Visa Debit. You can also feel good in that your friend that referred you will also get a $50 Amazon gift card (or $30) — as long as all the conditions are met. Usually those conditions involve verifying their mobile phone number, the referer also must be an “active paying MealPal member on a 30-day cycle for the 12 lunch, 20 lunch, 10 dinner, or 15 dinner plan, and must renew for a subsequent paid 30-day cycle on one of the noted plans” or “an active paying flex member who consumers at least 10 meals in the 30 days following the referred member’s sign-up date and who renews for at least one more flex cycle following the current cycle“. Formerly known as MealPass before re-branding in 2016, the service is brought to you by the same minds behind Classpass. 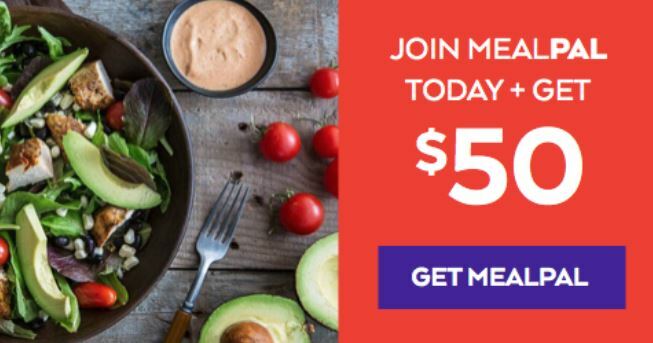 Yes, Join MealPal + $50 gift card!